It was the perfect excuse to put their feet up and have a well-earned interval from the hard work of putting on an act. But not the Alnwick Stage Musical Society – no, for them, the show must go on. The pressure was on, though, for the production to live up to those of the past, particularly the award-winning hat-trick of Sister Act (2016), Evita (2017) and My Fair Lady (2018), which raised the bar just that little bit higher. Without the staging, lighting and drama of the Playhouse, it was going to be a challenge for directors, the dynamic duo of Leonie Airlie and Kellie Hughes, who came together to organise the Society’s 30th anniversary in 2017. 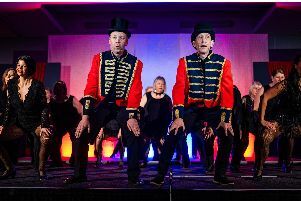 They chose to dispense with a full musical and opted instead for a celebration of song and dance, Cabaret on Broadway, including some of their favourite numbers from the shows, given the limitations of the venue at the former Lindisfarne Middle School. The audience sat around tables, enjoying a glass of wine with the entertainment. That obviously limited the numbers but not the atmosphere. ‘Our main aim was to showcase the incredible talent that our society has and give as many individuals as possible the chance to shine,’ they say in their programme notes. And so it was – 27 largely familiar tunes were delivered with aplomb. In fact, it was a masterclass in casting. Everyone seemed comfortable and confident with their part and a huge amount of fitting the right-sized pegs into the corresponding holes had been achieved. And the format gave everyone their moment in the spotlight, not just the handful that would normally land the star roles. They dipped their larynxes and dancing shoes into a range of musicals, from Chicago and 42nd Street to South Pacific and Anything Goes. Leonie and Kellie, with the support of Society stalwart Lynne Lambert as assistant director, the pair performed miracles. Despite the restrictions of the hall, their splendid choreography managed to put the stage to great use, spilling out to either side and into the audience for added effect. There were some obvious highlights. The outstanding moment of the first half was Mark Stenton’s If I Were a Rich Man, from Fiddler on the Roof. He started with a haunting intro on the electric guitar before a spellbinding, passionate rendition of the song made famous by Topol. It was worth the ticket price alone – such control and a voice you could listen to all night. After the interval, it was the turn of Diane Maughan to steal the show with the incredibly moving As If We Never Said Goodbye, from Sunset Boulevard, which had me welling up and breaking out in goosebumps. The irrepressible Peter Brown kicked off proceedings with Wilkommen, from Cabaret, ably supported, as he was throughout, by the great band. His German accent of the first half morphed seamlessly into French for part two. It was a rousing start with the suitably sassy Cell Block Tango, from Chicago; and the glitz, glamour and tap dancing thrills of 42nd Street’s Audition. A fantastic reprise of the group’s Raise Your Voice, from Sister Act, brought back fond memories and gave polished performer Leonie her first opportunity to connect with the audience with her glowing smile and superb voice – what stage presence she has! Kellie, as Roxie (Chicago), and Claire Teasdale, as Tallulah (Bugsy Malone) were both endearing and utterly convincing. There were plenty of laughs too – Money Makes the World Go Around, from Cabaret, was perfectly executed by Ali Wrangham and Peter Biggers; a proper knees-up with Gaston, from Beauty and the Beast, thanks to Mr Biggers and Anthony Stoker; while I Remember It Well, from Gigi, by old-stagers Arlene Cadman and Stuart Archer received the biggest cheer of the night. I loved the harmonies in many of the songs and the multi-layered Rhythm of Life, from Sweet Charity gave me a tingle in my fingers and a tingle in my feet. And as if to save the best ’til last, Gary Brown, with the performance of his life, and Mark Stenton, along with the rest of the cast, gave a rousing rendition of The Greatest Show. Strong voices, super dance moves and sheer enthusiasm made this powerful number a fitting finale. It had been a thoroughly enjoyable evening, from the stark scenery, the sound and dramatic lighting effects to the performances of cast and band – the hard work and commitment had paid off. Cabaret on Broadway proved that if the productions are up to scratch, an audience will be more forgiving of the venue. While the former Lindisfarne school hall is no Playhouse, the atmosphere was just as electric and the enjoyment as sweet. The technical team from the Playhouse – Andy Hunt, Andrew Mounsey and Kieran Dye – themselves performed miracle to give the shows an air of professionalism. Hats off to them! All proceeds from the five performances were donated to the theatre’s Show Your Support appeal, which has now reached the grand total of £721,375 in its crusade to reach the magic £800k mark. The Gazette is also backing the campaign by raising £1,000 through its Jam Jar Army appeal to sponsor a step on the new-look spiral staircase, by asking readers to collect loose change in empty jam jars. We have already received several jars full of coins, so keep up the good work and when your jar is full, bring it into the Alnwick office. The performers (in alphabetical order): Leonie Airlie, Sandra Appleby, Stuart Archer, Peter Biggers, Sally Black, Gary Brown, Arlene Cadman, Susannah Clapcott, Nicola Curry, John Firth, Lisa Gladstone, Sheila Graham, Becca Grey, Colin Grimes, Melanie Grey, Kellie Hughes, Carol Knowles, Lynne Lambert, Diane Maughan, Barbara Naylor, Margaret Reece, Mark Stenton, Sibylle Stenzel, Taura Stewart, Anthony Stoker, Claire Teasdale, Christine Trotter, Mary Walker, Ali Wrangham. The band: Ron Creasey, brass; Kirsteen Gray, bass; Mark Gray, percussion; Gavin Johnson, woodwind.